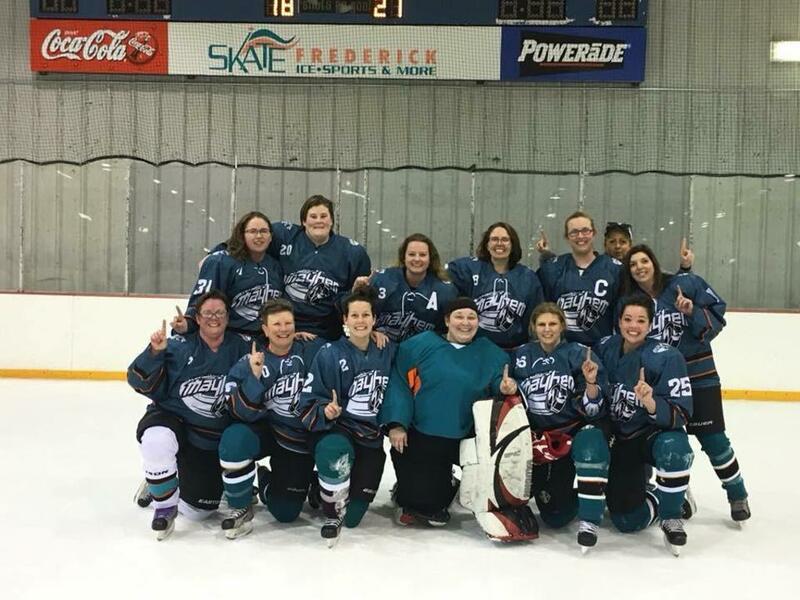 Congrats to the Hagerstown Mayhem for winning the lower tier Mid-Atlantic Women's Hockey League (MAWHL) championship this weekend! The Mayhem entered the playoffs as the lowest seeded team. They won both of their games to claim the championship. The games were played this past weekend at Skate Frederick in Frederick, MD. In the first game, the Mayhem faced the Frederick Firestorm. The score was tied 5-5 at the end of regulation. 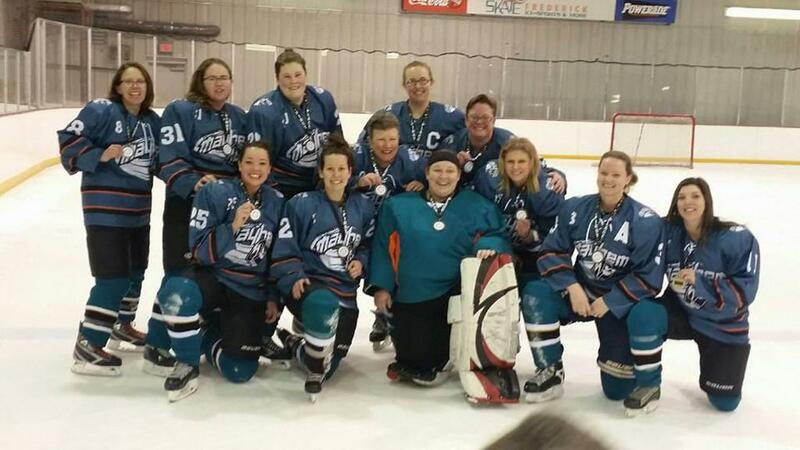 As time ticked down in the sudden-death overtime period, Danielle Grove scored with 20 seconds on the clock. In the championship game, the Mayhem defeated the Chesapeake Bay Lightning 6-3. This improbable victory came after a regular season in which the Mayhem went 1-13. This weekend provided a team, with nothing to lose, an opportunity to shine. Team captain Katie Butler plays center. She was thrilled with the outcome, but equally satisfied with the foundation set by the team. "We went into this season with the goal in mind that we wanted to play more cohesively as a team," Butler said. "Winning is great, but it wasn’t our focus. We wanted to grow as a team - develop our skills, work on communication, and learn to play as a group." Did the competition underestimate the Mayhem? 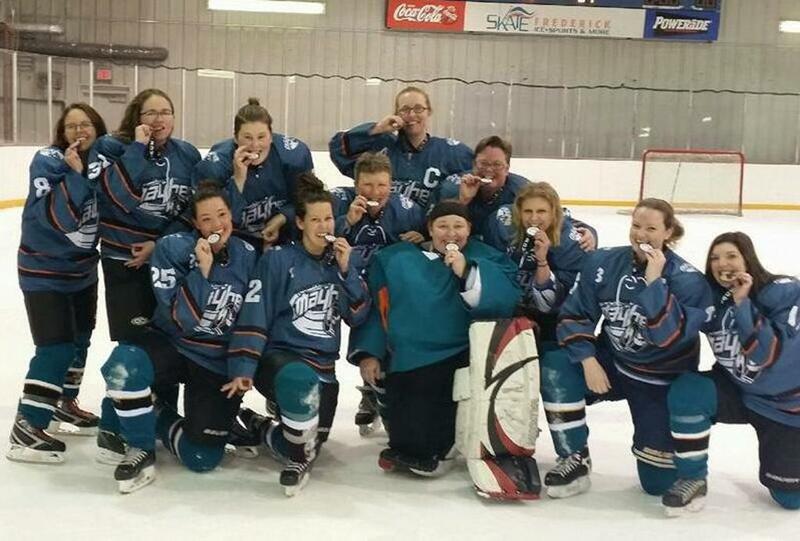 "When we showed up at playoffs this weekend, we had nothing to lose. According to our stats, we were the worst team in the league and of no threat to any of the opposing teams," Butler stated. "We could tell the other teams felt that way, and we used their underestimation to our advantage. That win against the Firestorm lit a fire in us that carried right into our Championship game versus the Lightning. We scored some early goals, which increased our confidence. Both games were the best we’ve ever played as a team in our five seasons of existence." After going from "worst to first" this past weekend, Butler reflected on what this means for the Mayhem's future. "I am so proud to call these ladies not only my teammates, but also my friends," she said. "Heart and love for the game won’t guarantee victory, but this weekend definitely proved that those things can make a huge difference. We are so excited to carry this momentum forward next season."